Historically Gold is seen as an investment that is immune to the ravages of inflation and was considered as safe asset during the times of economic recession. Culturally, it is seen as insurance policy in bad times. Unlike paper currency, coins or other assets, gold has been maintaining its value throughout the ages hence people see gold as a way to pass on and preserve their wealth from one generation to the next. Because of the above said reasons at times people, fund managers etc see Gold as an Investment vehicle. In this article you will get to know the following important aspects , when it comes to Gold as an investment. How the gold price is set? As far as history of money goes, gold was the determining factor in the value of currencies. Each different currency represented a redeemable amount of gold. But that ended when the US abandoned the gold standard in the 70s and the US dollar became the world’s reserve currency without any precious metal backing. These days, the gold price is primarily set in financial markets, just like for other metals. In fact, about 15,000 times more gold is traded in financial markets than there is actual physical gold in the trading process. The financial market price is set between the London Bullion Market Association (LBMA) trading and the COMEX contracts in Chicago. The price of 10 grams of gold in India has increased from ₹29,070 in January 2018 to ₹31,448 in May 2018. So should an investor buy gold? Over the last 2 decades, Sensex has provided annualized returns of around 12 percent while gold has earned 10 percent. In the last 10 years, Sensex has risen 10 percent whereas gold 5.82 percent. In addition, in the last one year, the Sensex has risen 16.3 percent and gold by 6.44 percent. Central Bank Policies – Central Banks around the world hold gold in their reserves. Most central bank add gold to their reserves to hedge against their dollars. China, India and Russia are adding more golds to their reserves. In March quarter ending RBI added 2.5 tonnes of gold in its reserves – first since 2009. RBI could further purchase the gold which could increase the prices of yellow metal worldwide. Looking at the recent trend we see central banks have been buying gold at an accelerated pace and there is no reason that central banks will stop. Central bank also affect gold demands through monetary policy , with EU and US following expansionary monetary policy, gold prices are expected to see a rise. 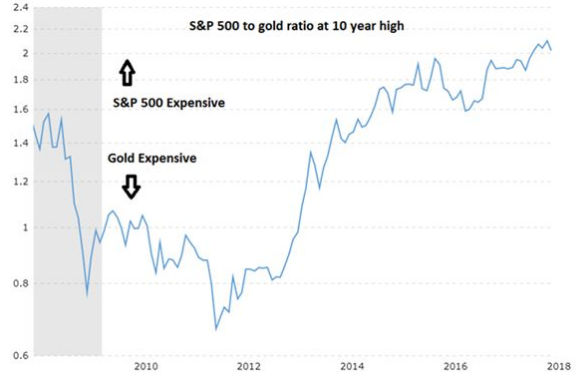 S&P 500 to Gold Ratio – Compared to stocks, gold is being traded at a discount. Gold to S&P 500 ratio (the number that tells you how many ounces of gold it would take to buy the S&P 500 in any given month) is at its lowest point in 10 years (Look at the average S&P ratio in the following chart). For reversion to occur; either the gold price needs to appreciate or share prices need to fall. Equity markets remained in focus during FY 18 due to high returns and overshadowed gold last year. Gold also gave a decent return of 13% and annualized return of 13.66 % during last 15 years. 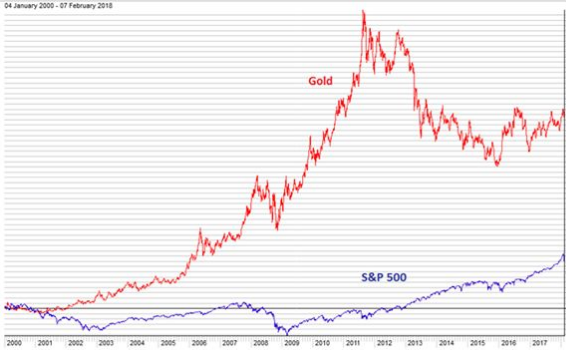 Quick glance at the chart would tell you that gold outperformed S&P by decent margin. Geo-political Tension – With USA pulling itself out of Iran Nuclear deal has send the prices of crude oil to new high in the recent years which has raised the fears of inflation worldwide. Past trends show that gold prices rises inline with the inflation . Demand for Gold ETF and Trading volume on COMEX – It is believed that prices of Gold are set by demand and supply of physical gold but its not entirely correct. The research shows that International prices are set by Over The Counter (OTC) spot gold market trading and COMMEX gold future trading. Gold-backed ETF holdings are now at their highest level since 2013. This interest is likely to remain high this year too, as investor are buying Gold to hedge against overvalued markets and insure against the increasing possibility of a crisis. Continued ETF demand is likely to push the price of gold. Moreover gold-trading volumes on the COMEX have never been higher and there’s no indication heightened activity at the COMEX will stop, and so are the gold price. Investment in Gold coins and Bars – Investing in gold coins and bars is a better option instead if buying gold jewellery. While buying gold jewellery, there are heavy making charges involved which vary from 10% – 20%. When you try to sell this same jewellery to a jeweller, he will buy the gold below market rates and cut the making charges too. Gold ETF -Gold exchange traded fund is similar to a mutual fund which invests in gold. This is listed in the stock exchange. You need to buy Gold ETFs from the stock exchange just like a normal stock by paying brokerage fee for buying and selling of these Gold ETFs. The brokerage charges vary from 0.2% – 0.5%. Gold Futures – You can buy into gold futures. These future prices tend to track gold prices, and the contracts have to be settled with a predetermined period. For example, if you buy a gold contract of Sept expiry, you have to make sure you settle the same by Sept. Gold Futures are risky, as you have to settle the contract, even if you make a loss. In case of gold coins and bars, you can continue to hold the same, if you incur a loss. The one advantage of buying gold in the futures market is that you have to pay only a 10 percent margin. Like so many things in life, however, simple questions can have very complex answers. In the case of gold too, the answer is complex, it is a risky asset class, and it would be unwise to invest only in the gold. However, because gold is viewed as a store of wealth and hedge against uncertainties, you shouldn’t dismiss it as an investment option. Investors tend to flock to gold when they are scared, which boosts its value when assets such as stocks are falling. It just needs to be paired with a more broadly diversified portfolio so you can benefit from the non-correlated nature of gold’s performance. But before making an investment in Gold, following pros and cons should also be kept in mind. Investing in gold has its share of disadvantages as well which are mentioned below.